Our road trip was drawing to a close now. We slept at a relative’s house in Wangaratta on the sixth night and had the car packed and ready to leave by seven thirty the following morning. 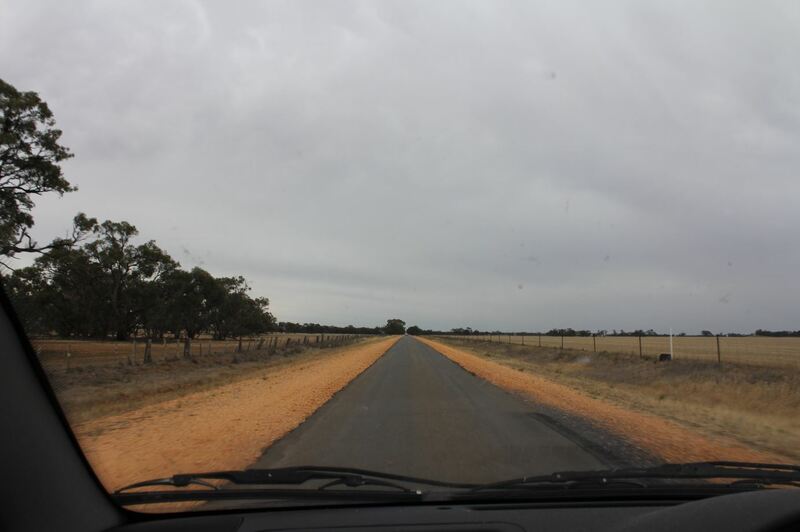 The plan was to view my grandfather Ken Dunstall’s grave in Birchip, and explore some new roads along the way. Wangaratta to Benalla to Shepparton was a road already travelled. This time at Shepparton, we needed to go to Echuca. We’d learned about Shepparton now and forewarned is forearmed. We’d printed a map with google road directions and we followed it closely. Without too much stress, we found ourselves on the road in the picture above. I don’t have much family history from this region. We drove past fields full of hay bales, it still being the middle of harvest, and grain trucks were all around. The signage was excellent. 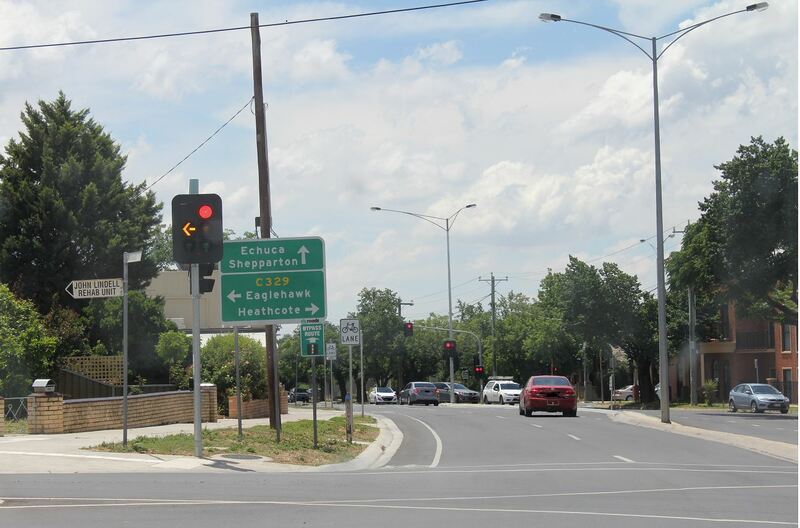 As my son pointed out, there’s always a sign to Echuca from every direction. We reached the rural city of Echuca by 10:30 AM. 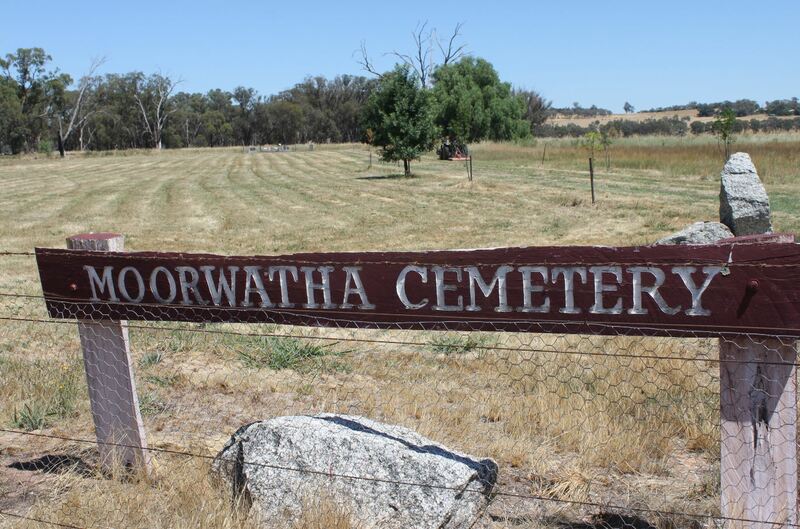 It occurred to me coming into town that my husband’s grandfather might be buried in Echuca. The man was somewhat estranged from the family and ended his years living in a caravan in one of those little twin-towns that exist all along the Murray River. I wasn’t quite sure but I thought Echuca was the one. I sent a text to my in-laws and while I waited for a reply, we went straight to the cemetery. Echuca was a very nice rural city. Well run, full of helpful people and most magnificently signposted. You notice these things as a traveller. Clean public toilets everywhere, park benches along the river, friendly people. I asked for directions to the cemetery in a post office on the south side and started a conversation between all customers and staff on the best way to get there. I always enjoy these social moments with strangers. The cemetery had staff onsite to look up their records and I learned very quickly that my husband’s grandfather was not buried there. This was a show stopper. I then received a text from the in-laws saying they didn’t know where he was buried and would ask my father-in-law’s sister. It turns out she did not know where he was buried either. Now, the plan is to ask the final sister. Here’s a task for me. I was feeling pretty bad not knowing where my grandfather was buried, but these guys didn’t even know about their own father! It seems clear that neither attended the burial. That man is high on my list to introduce to his family now. I’m sure there were good reasons for the estrangement, but the man passed away at least twenty years ago. We left Echuca at about half past eleven in the morning. West of Echuca the terrain changes. The farms are bigger, the land is flatter, the towns are further apart. We came into Cohuna a little after midday but did not stop. The plan was to have a late lunch at Kerang, some 95km from Echuca. We were in Kerang by 1PM and enjoyed lunch there. It’s another beautiful little town, a decent size and with a lot of activity in the shops. After lunch we were ready for the challenging part. From here, we had to leave the Murray Valley Highway and head in a zigzag along a series of rural roads, in an area probably without mobile phone service. I filled the tank at Kerang just in case we became lost, double checked my directions and we headed off. The towns we wanted were Quambatook, Towaninny and Dumosa, then to Birchip. We had some written instructions telling us where to turn right and left. We had plenty of time. We boldly set out, my son manning the direction sheet while I drove. This was emu country. My son saw some but since I was driving I missed them. We knew they’d be there somewhere in the shrubby trees. There was very little traffic and the roads were long, straight and narrow. We had no trouble finding Quambatook. There were hardly any opportunities to turn off the road and it was signposted beautifully. It was a nice little town, seemingly deserted with an incredibly wide main street presumably filled with grain trucks at times. We stopped here to stretch our legs and didn’t see a soul. There was a sign to Dumosa as we left town. This was encouraging. However, just out of town we struck a big hitch. Here it is: an intersection that google didn’t give us directions for – that had two options, neither of them a town we were heading for. 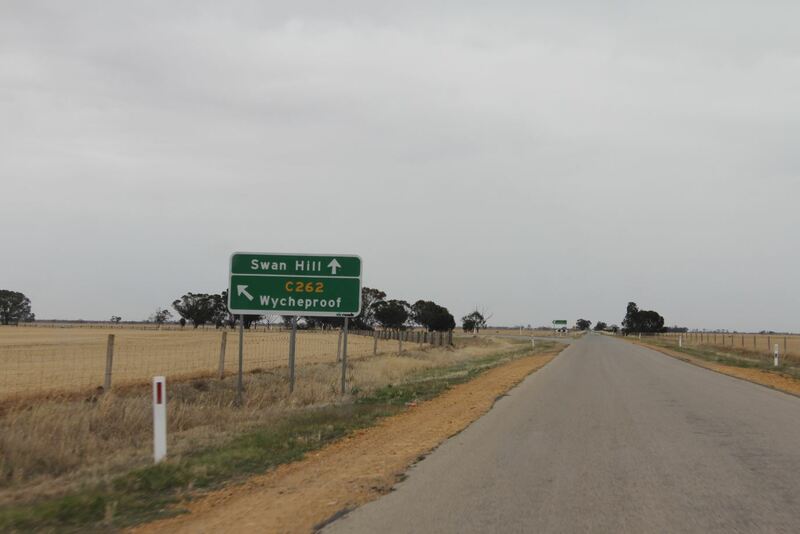 Swan Hill or Wycheproof? We had little time to decide with a truck coming up behind us, and each of us agreed on Wycheproof. From this time on, there was a little bit of stress while we watched for signs to Dumosa. There simply weren’t any. As it turned out, we were on the right road all along – I think – but there were no signs to anywhere. We never did see another sign to Dumosa and did not find Dumosa. We didn’t find Towaninny either, or a sign to it. 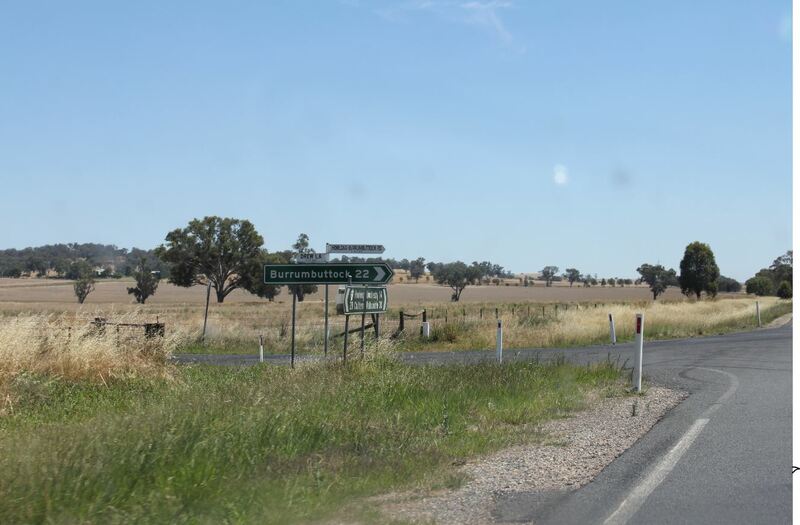 What we did find was an intersection with a road number on it that we knew was correct, pointing to Birchip. From that point, we relaxed a little and enjoyed the very small rural road we were travelling on. 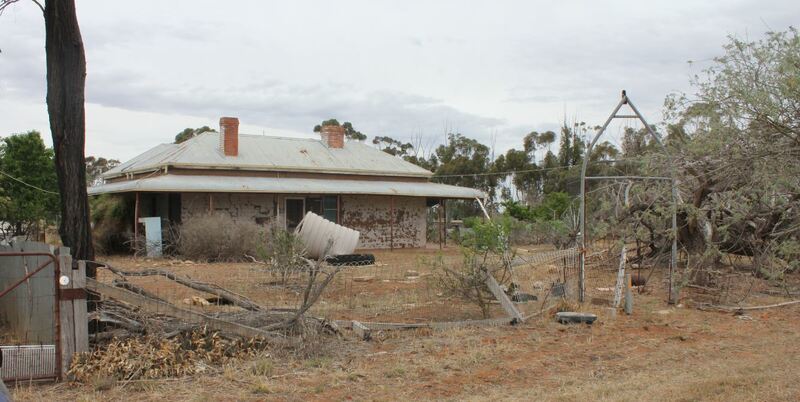 After 50km of narrow road, red dirt and open fields we saw rooftops in the distance, and suddenly we were in Birchip. Home of the Mallee Bull. It was now about 4PM. I have posted my grandfather’s grave in the blog about Kenneth Dunstall, so I won’t repeat it here. Since it was still quite early, we headed for Watchem, the nearby town where my grandfather finished his days, and where the family still own a property with one house on it. I was very keen to see it. Watchem was a very pretty little town, but it looked something like a ghost town. There were a few derelict buildings and a few empty service buildings. There were also some occupied, well maintained homes. It was a mix. We had to phone for directions to the house as the street it was on had no signpost. The town obviously has a long history and I’ll have fun researching it one day. In the meantime, we were beginning to feel weary after the day’s travel and were glad to find the house. Armed with a letter of permission from my aunts, I met the man who lives on the property to keep it safe and went to explore the house, seeking any clues about my grandfather. The family bought this house because it reminded him of his childhood in Western Australia. Yes, it’s a mess. Since my return home I have conferred with my aunts and uncle and we have initiated some much required maintenance. It’s a lovely house and were it not for the cobwebs I would have enjoyed exploring the rooms. It must have been charming in its heydey, and if lived in again it would still look quite charming. However, it is beginning to fall down too. I found very few traces of my grandfather, but they might yet be in there. Instead of searching for signs of how they lived, we found ourselves making a rather clinical inspection of damage and danger areas, and identifying the various pests which were moving in. We also spoke at length with the occupant who told us of a few other issues. I hope to make another visit at some point. It was getting late. Since I had permission, I collected some likely tins and folders of papers to bring home with me. 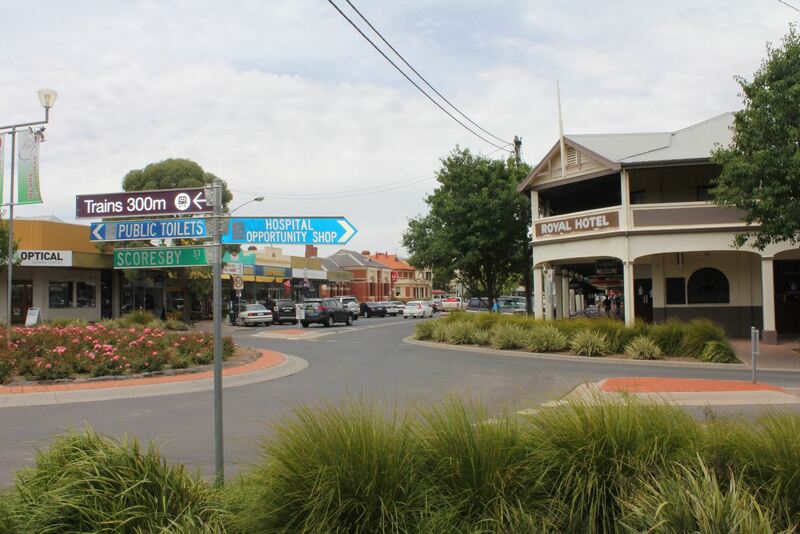 We left at about 6PM and headed for Dimboola which was a distance of about 90km. From here we were back on the familiar A8, the highway from Melbourne to Adelaide. We slept the night at Keith, and arrived home at midday on the eighth day. This brings the road trip to a close. It was a very full week and a day of making discoveries and connections. Days later, I am still going over all I have learned, and getting to know my living relatives was a priceless experience. One day, I hope to do it all again! Once upon a time there was a small but thriving little village called Moorwatha, situated in New South Wales close to the Victorian border. The village no longer exists. I’d never heard of it until two weeks ago, when I found a newspaper reference to a Mrs Peard who was schoolteacher there in the 1880s. My Peard family was in this decade at Albury. Moorwatha being about 30km (20 miles) from Albury, I felt there was a chance this was a family connection. Initially I hoped it would be my own great great grandmother Mrs Mary Ann Peard, but it turns out to be a Mrs Elizabeth Peard. Nonetheless – a clue to be filed away for further reference. I have so far identified three family groups surnamed Peard who emigrated to Australia, and all of them come from Cork in Ireland. If we could just find the records, I’m sure they will all turn out to be distant members of the same extended family. John Peard born 1840 in Cork, Ireland emigrated alone in 1856 listed as ‘gentleman’, private passage to Sydney NSW. He’s my ancestor and married Mary Ann Burleton of Bowna. They had many children. In this family group is another emigrant, Richard Peard and his wife Bridget Collins. Richard was my John’s uncle and a soldier, he came out with his regiment and retired here. Richard was probably the first of the Peards to arrive in Australia. John Peard birth date unknown arrived on ship Aliquis in 1856 into Port Adelaide, South Australia. He also came from Cork, Ireland. Passage details unconfirmed. 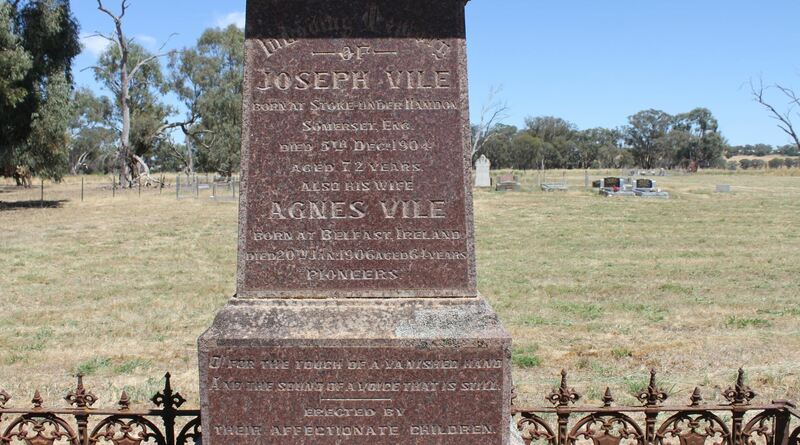 He had a fling with two girls in a remote mining town in South Australia who each gave him a child in the same year, then headed for Victoria with one of the girls and their daughter Jane. Jane married William Williams in 1874 in Victoria. They stay on the radar because one of my John and Mary Ann’s daughters also married a William Williams, of a good age to be the son of this couple. Nothing confirmed. John and his chosen girl may have had more children that I have not found. Thomas Peard and Amelia Haylock came from Cork, Ireland in the early 1850’s and settled in Wangaratta, Victoria, a mere 73km (45 miles) from Albury, all children have the same family names and they seem to have had a similar level of education and aptitude for farming. These guys have been traced back to 1800 in Fermoy, Cork which is exactly where my guys were in 1800, but records are thin on the ground. Mrs Elizabeth Peard of Moorwatha is surely connected to one of these three family groups. 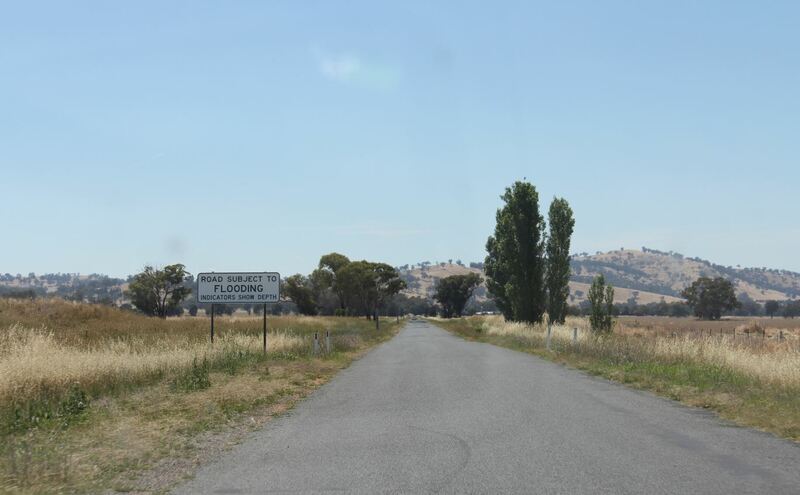 Moorwatha was on no map that I could find, and driving down the Hume Freeway was not likely to give us a signpost. Luckily, I knew that it was near Howlong as the newspaper article had mentioned this. 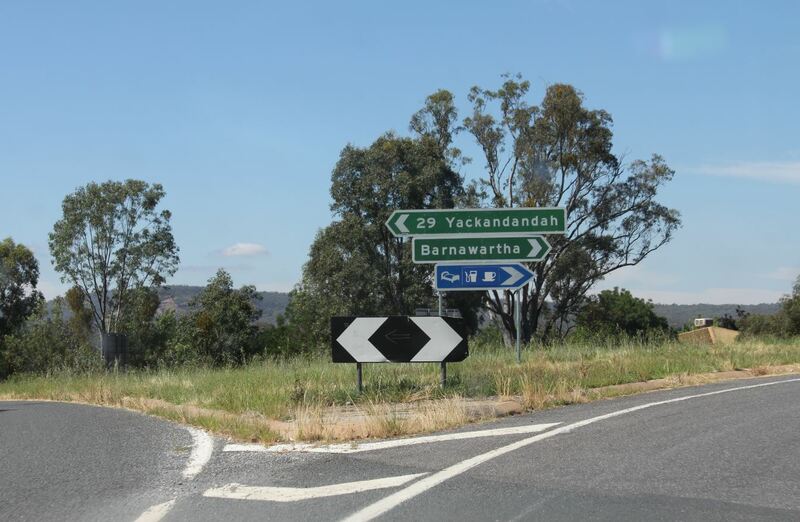 Further, when visiting one of my aunts a few days earlier I had passed through the sleepy little town of Barnawartha, and distinctly remembered a signpost to Howlong. The way was clear. This was not a major road. Sealed and well painted, but without much traffic and a very pleasant drive. 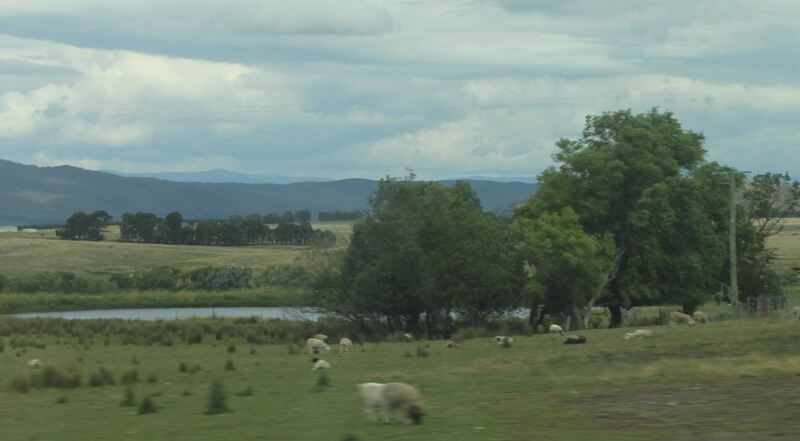 We crossed the border again from Victoria into New South Wales and drove into Howlong. I knew Moorwatha would not be signposted and the thing to do was seek directions from a local. Luckily, there was a history room on the main street manned by a most enthusiastic and knowledgeable lady. She didn’t know how to get to Moorwatha but she had heard of it! What’s more, she could tell me that it was a parish north of Howlong and had a cemetery and the ruin of the old church. The best kind of news! It took half an hour on a very slow council computer, but the lady found us some directions. 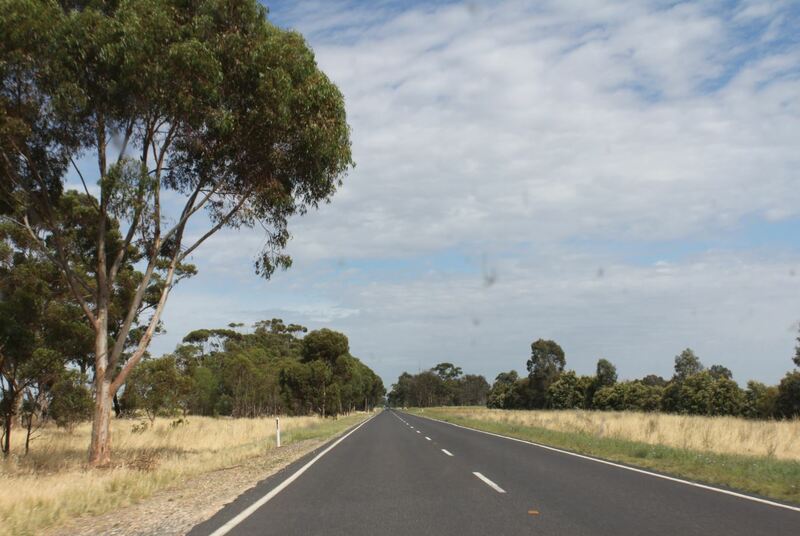 Head out of town to the north, she told us, then turn onto the Burrumbuttock Road. Several kilometres along this road we should spot the cemetery. It sounded quite simple. What could go wrong? We set off full of confidence. Actually, the directions were pretty good. The only thing was an extra stretch of road. 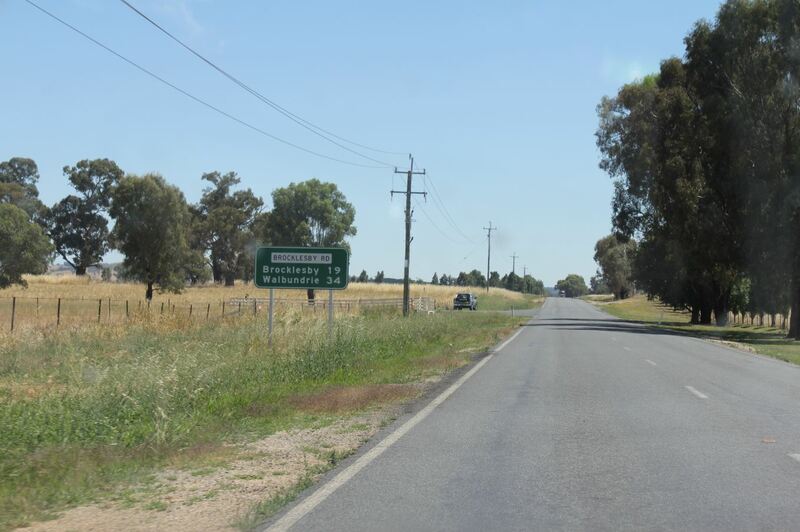 We wanted Brocklesby Road which was signposted to Walbundrie and there was no mention of Burrumbuttock at all. So we drove halfway to Albury and then realised we should have seen the turn by now. We turned back and tried the road to Walbundrie, which was still a good road. Only a few kilometres along here we found the road to Burrumbuttock, nicely signposted. Each turn we made took us onto a narrower, more minor road. This makes for interesting scenery, if like me your favourite scenery is old houses and properties still laid out as they must have been a hundred years ago. I do love the little old roads. I was expecting to find Moorwatha after about ten minutes of driving. It took about twenty minutes, maybe longer, but then we came to the old church building, pictured at the head of this blog post, and knew we had arrived. There was nothing but the church and a whole lot of fields and some patches of trees. Being behind a fence, I assumed it was private property so I didn’t go in. 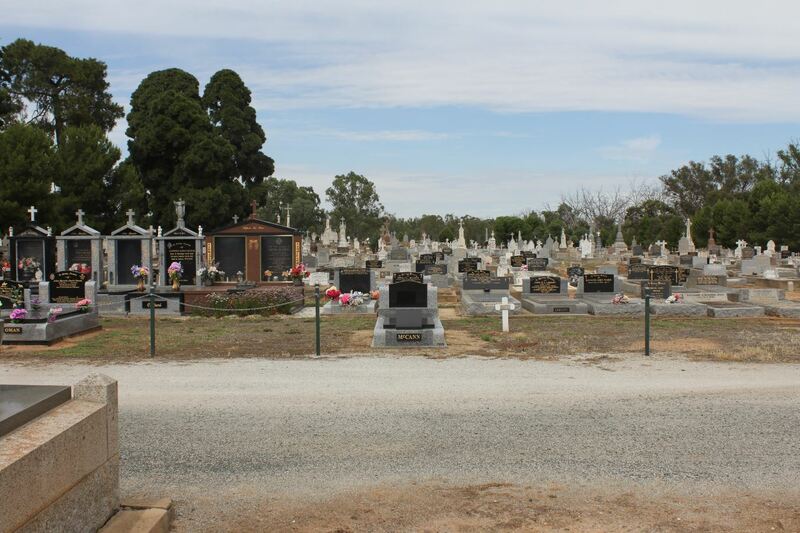 We drove on and nearly missed the cemetery which was about a kilometre further on. In the photograph of the cemetery sign, a tractor can be seen in the background. This man was cutting the grass in the cemetery grounds and had he not chosen to do this today, we would never have spotted the graves or the sign. It was the most astounding piece of luck. I don’t think they get many visitors at Moorwatha, he was probably very surprised to see us. 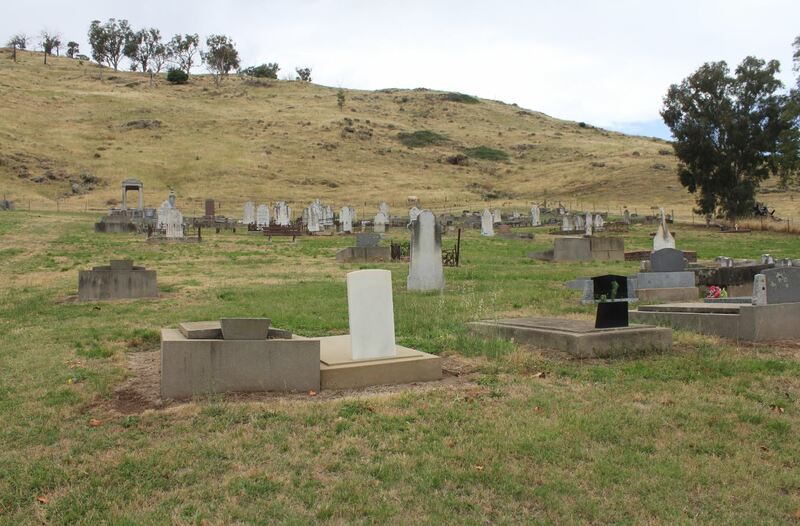 The cemetery was basically three clusters of graves belonging to three families – the Vile family, the Maxwell family and the Weule family. There were some other graves, but these were the plots with their original headstones, obviously maintained through the years by the families still in residence. I have a Vile in my own ancestry, the great great grandmother of Mrs Mary Ann Peard nee Burleton. What’s more, Mary Ann’s family came from Somerset as did this Vile family! I thought for sure I was onto something. 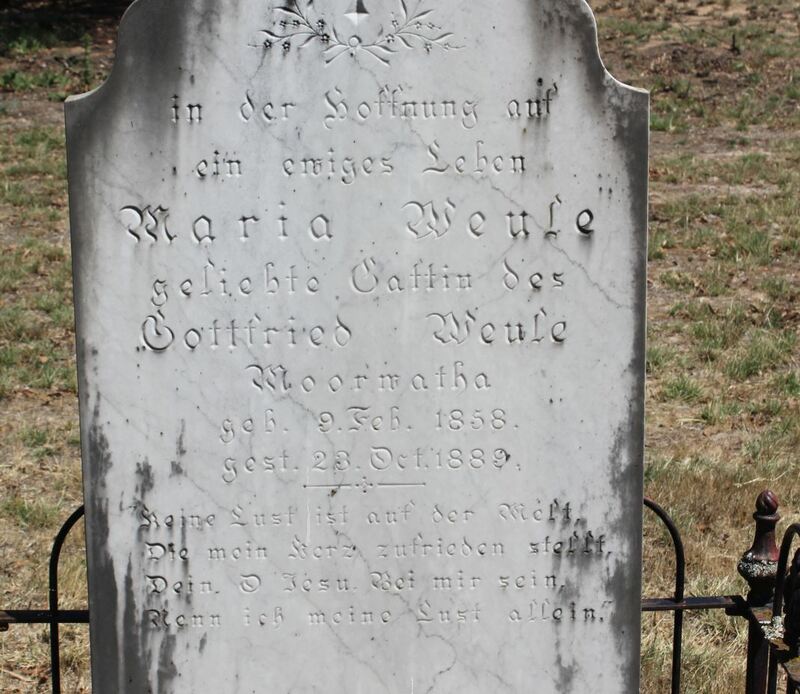 Then I found the surname Weule and was even more excited! Certainly, research to be done here. In the meantime, we finished by looking at the Maxwell graves and photographing them, then considered the job done. The man on the tractor was still hard at work cutting the grass. As we headed towards the car his curiosity obviously got the better of him and he turned off the engine and came over for a chat. He asked if we were related to the families here and I said the Weules looked like our family. I’ve lived in very small rural communities all my life and I know very well how the locals need to be able to find a place for a newcomer. I told him about the ones at Tumbarumba and he said yes, there were some of that family in the Snowy Mountains, and another lot towards Benalla. He was a Maxwell himself, but he knew the Weules well. 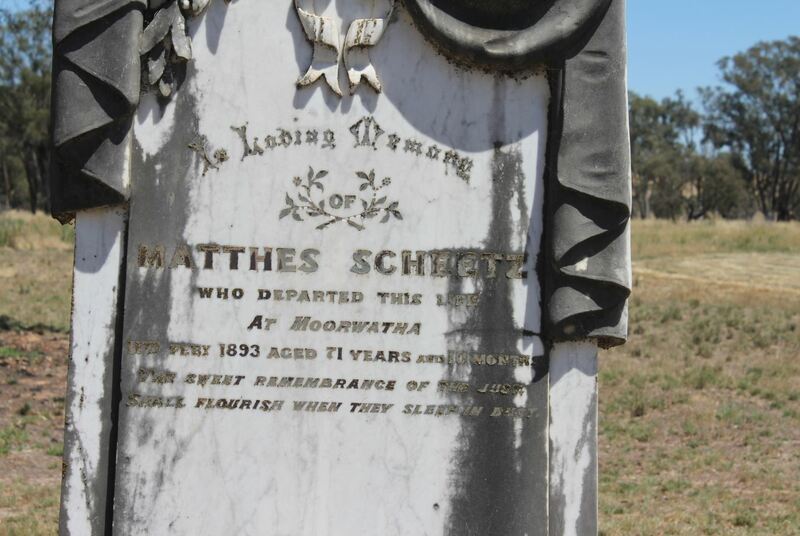 He had been born in Moorwatha and the local farmers maintained the cemetery because their family were there. He pointed to the paddocks around us telling us which had belonged to Weules and which still did. He also directed us to speak to his 90 year old father in Howlong, but unfortunately we did not have time to do this. He then pointed out a lone grave – right across the field from all the rest. “No one knows why it’s over there all on its own.” He said. “It’s the oldest grave in the cemetery.” It was the area of the field that he’d just been cutting, and I’d never have spotted it. After several minutes of chatting, my quite patient son was becoming fidgety so we said our goodbyes and headed off, feeling very welcomed by the friendship and assistance we’d received in Howlong and here in Moorwatha. It was a detour well worth making. 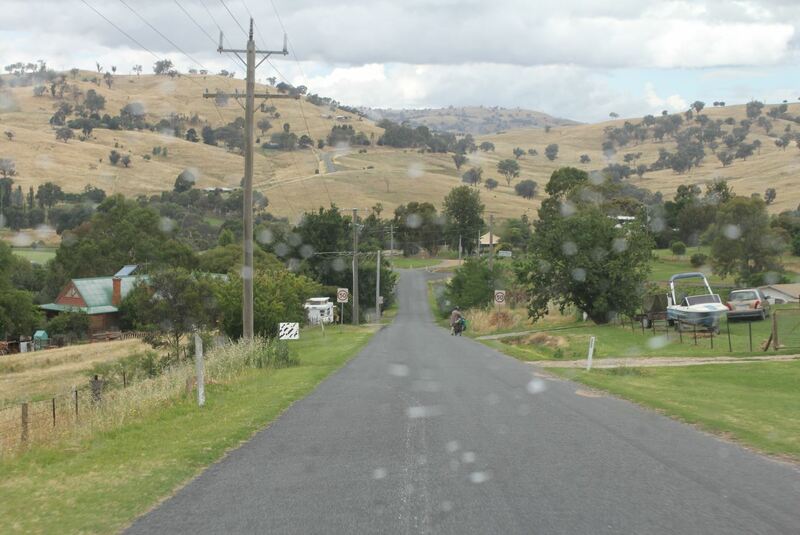 We arrived in Tumbarumba on Sunday evening and stayed only two nights and the intervening full day. It’s hard to believe, given the amount we fitted into that flying visit. As usual, we camped at the local caravan park in our tent. We found the place full of blueberry pickers, seasonal workers who were doing exactly what my great grandfather did all those years ago. Going to sleep on our first night, we could as easily have been in an overseas country, which was a nice touch. I don’t think there was an English speaker amongst them, but most shared a language. In some ways it was problematic though, as the pickers did not share the usual tourist ethos of using facilities and quickly as possible and freeing them for the next camper. These guys were living there and spent all night in the camp kitchen playing rap music and having huge cookups with the single camp stove. Our phone batteries went flat and we ended up eating at a cafe down the street which was an expense I hadn’t budgeted for. A few fellow tourists were quite disgruntled and cut short their stay in the town. Due to language barriers we had little success if we asked to use the electric jug or a powerpoint. Many of the pickers were sleeping in their cars and the campsite looked a bit like a carpark at times. But they were very friendly and there was certainly no alternative venue for them to sleep in. Apart from our visit to three families of relatives and the exploration of the house and farms, here’s a summary. We were given copies of some photographs and I used my camera to obtain more. and we went to look at the memorial plaques on the property. It was a very full day which went from about 5AM till 10PM, but on Tuesday morning we packed up our tent, loaded the car and headed out of town. I very much hope it is not another five years before I can return. The Snowy Mountains was our furthest point from home. From here we were on the way back. 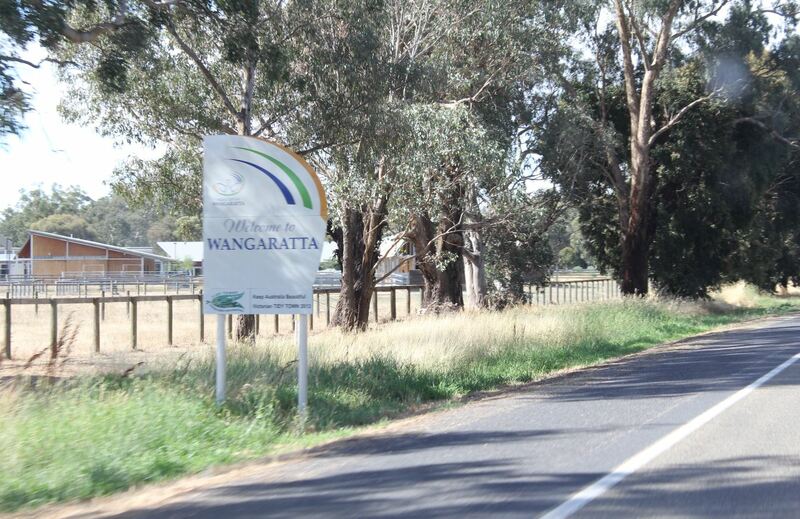 The plan on this Tuesday was to return to family at Wangaratta, an easy drive of 220km. Having left Tumbarumba by 8AM, we had a whole day to fill in. So, I pondered, what was on that route that we could go visit? By 1861, my great great great grandfather Francis Burleton was a member of the School Board at Bowna, so at that time it was big enough to have a school. It had it’s own cricket team. There was a tennis court and the residents held balls and concerts. This was a properly settled place and must have had a cemetery and a church too. This is where his daughter Mary Ann Burleton was living when she met immigrant John Peard. They were the parents of Burleton Herbert Peard my great grandfather. All we found was a single sign. Not a house, not a person, not a single lone chimney in a paddock. 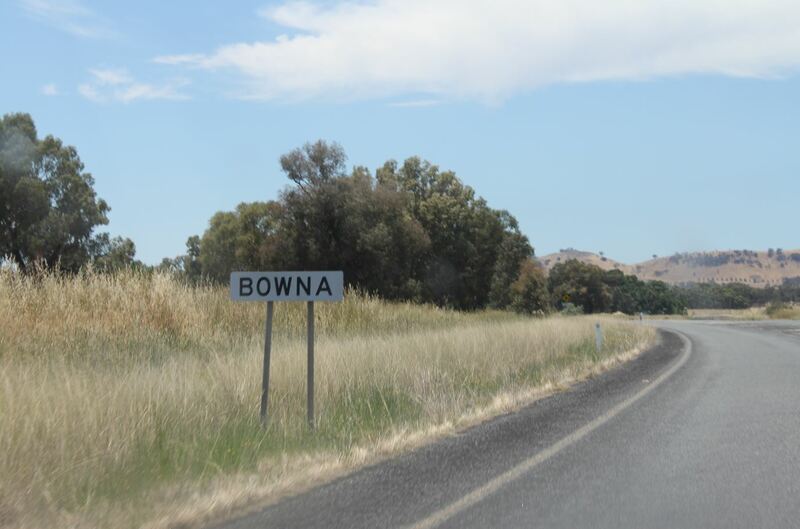 I can only assume that in the years the road has diverted and this sign refers to the district of Bowna. At two points we could see the odd roof across the paddocks but no way of reaching them. Somewhere in this area is undoubtedly a small cluster of old trees and dwellings. For us, this detour was a bust. Scrolling through old newspapers, I had recently found a reference to Mrs Peard,the teacher at Moorwatha. My own family of Peards were the only ones I had ever seen reference to, and I wondered if this might be my Mary Ann Peard nee Burleton, in this little community some 80km from where I expected to find her. As it turns out, this was Mrs Elizabeth Peard and I have absolutely no idea who she was. I have not properly researched my Peard 4th and 5th cousins and had better do so. Some of my unidentified DNA matches might come from this line! Our journey to Moorwatha was very enjoyable. I’m going to give it its own blog post for the sake of others who might have ancestors there. This post brings our journey to lunchtime on the sixth day. 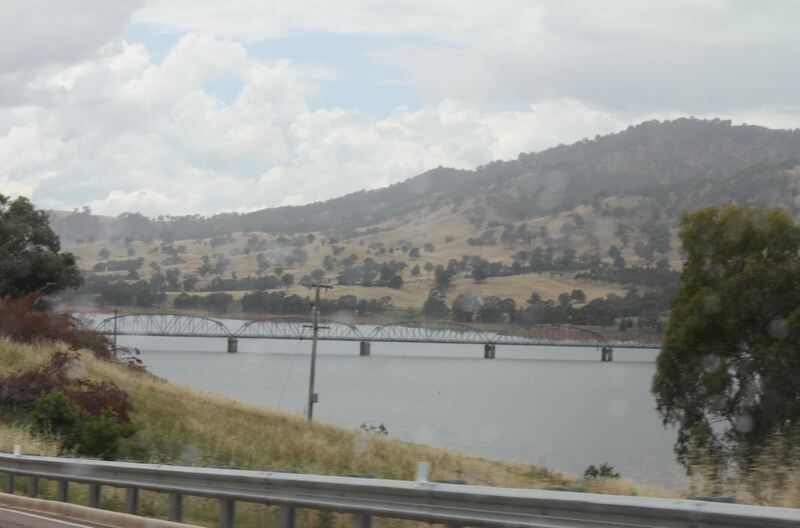 Heading south on the Hume Freeway at the New South Wales – Victoria border. Running roughly parallel to the eastern coast of Australia, a little bit inland, is a line of mountains known as the Great Dividing Range. It extends from Victoria right up into Queensland. The Great Dividing Range is, more accurately, a series of ranges which were discovered one by one and eventually correctly positioned on the map. In the early days of white settlement, Australia was a difficult place to map. The terrain was hard and the weather was extreme. The Great Dividing Range was truly a barrier which divided coastal Australia from the inland. Even in the 1830’s after fifty years of settlement in New South Wales, what lay beyond those mountains was still wild and unseen by many. The highest mountain in Australia, Mt Kosciuszko, is in the Snowy Mountains, a section of the Great Dividing Range in New South Wales. 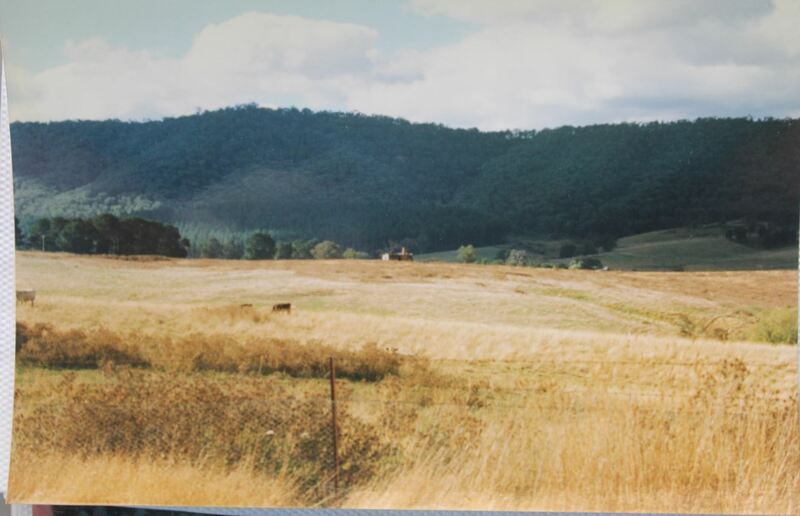 The farming district of Mannus is also in the Snowy Mountains Range, but further north and close to the forestry town of Tumbarumba. You can see Mt Kosciuszko from Tumbarumba, but somehow I did not take a picture. Tumbarumba has an elevation of 592m (1,942 ft) above sea level and I choose to visit in summer, as does my mother. It snows here in winter and can have very chilly daytime maximums and seriously cold nighttime minimums. Mannus is about 10km from Tumbarumba. Like so many rural districts, it once had more of a centre than it does now. It was the location of a cattle station owned by Robert McMicking/McMeekin/McMeakin who settled in 1856. He seems to have been something of an autocratic man. He established share farming on his land in the 1890s and my William and Fanny Morey were amongst the share farmers. The climate must have been a shock to Wiliam and Fanny coming from Bethanga. 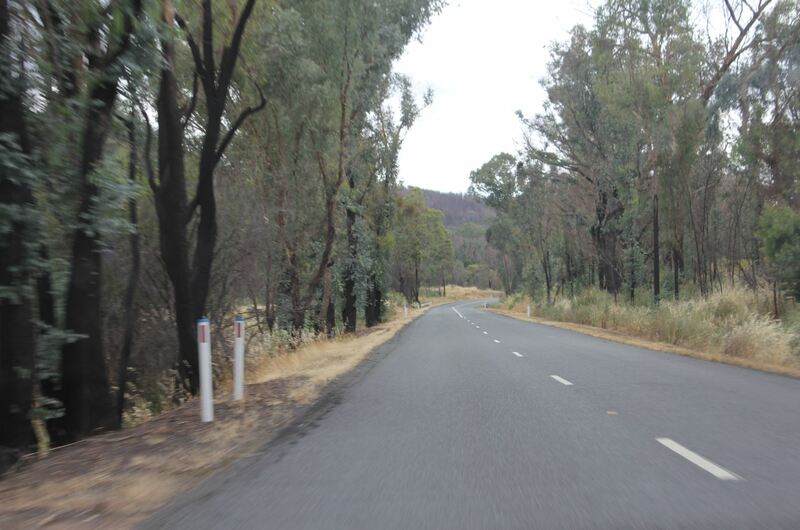 As soon as we turned off the Hume Freeway towards Tumbarumba, the surroundings changed from flat open fields to close trees. The road is a slow uphill all the way, and I can remember doing this trip in my grandfather’s old car in the 1970’s when this leg of the journey took us about two and a half hours if not more. The road is much better now. There are still both Moreys and Peards in Mannus – plenty of the former but very few left of the latter. The current Peard was the only son and has no children. The property will probably pass to one of his married sister’s children. At least it will be in the family, but sad to see a line die out after 115 years. William and Fanny Morey’s daughter Stella was my great grandmother. 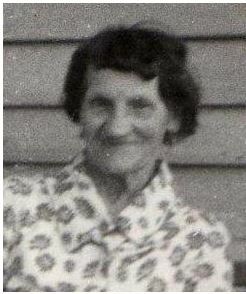 Stella was born in Bethanga in 1887 and was aged about 12 or 13 when they moved to Mannus. She was nearly of an age to go out to work. I don’t know much about her childhood. She could read and write, but not very well. She had the sunny disposition which seems to characterize most if not all female descendants of Fanny Morey nee Fox. Of the nine children in her family, Stella was bang in the middle with four older and four younger siblings. I have no pictures of her in her young days and no good picture at all. She is the lady who is responsible for my family history work, it was her family stories and her interest which got me started when I was ten. 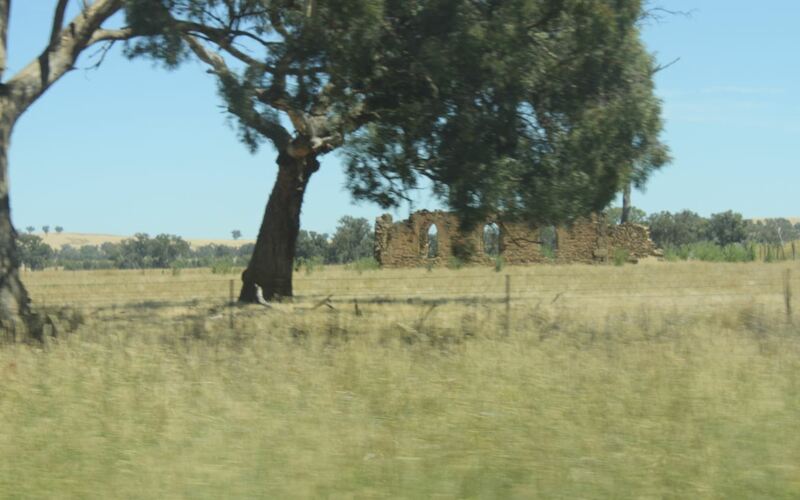 The ruins of William and Fanny’s home can still be seen at Mannus, but it is a long way from the road on land now owned by the Mannus Correctional Facility – known thereabouts as ‘The Prison Farm’. There’s always a chance of a private landowner granting permission to access their land to photograph a ruin, but the chances are pretty slim when it’s a jail. This picrure was the best I could do. This is the area. Remains of William and Fanny Morey’s home from the road. 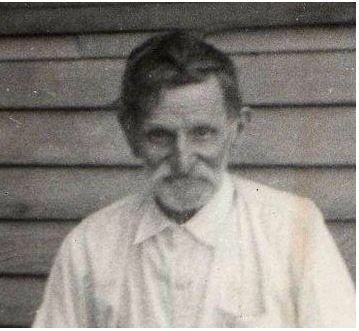 My great grandfather, Burleton Peard, arrived in Mannus in a year unknown but probably somewhere around 1900 also. Our existing family at Mannus were pondering during my visit on which of them arrived first, but we did not have enough information to deduce it. Burleton was born in Bowna, New South Wales in 1879, the seventh child in a family of twelve. His father was an Irish immigrant, listed on the shipping record as a ‘gentleman’. His mother was the daughter of a family of good name in Somerset, England. We know that Burleton began working on the family farm at the age of 12, and that he had no choice in this. His father was a strict man, but a fair man and one who had an understanding of property management. Burleton’s first visits to Mannus were as a young man when he would ride a pushbike up there for seasonal work, and return to his parent’s property afterwords. That’s a colossal amount of uphill riding! Somewhere up there, Burleton Peard met Stella Morey who was eight years his junior. He and Stella were married at St Jude’s in Tumbarumba in 1908 when Burleton was 29 and Stella was 21 and they lived first at Tallangatta near Bethanga. Their first child, a son, was born here. 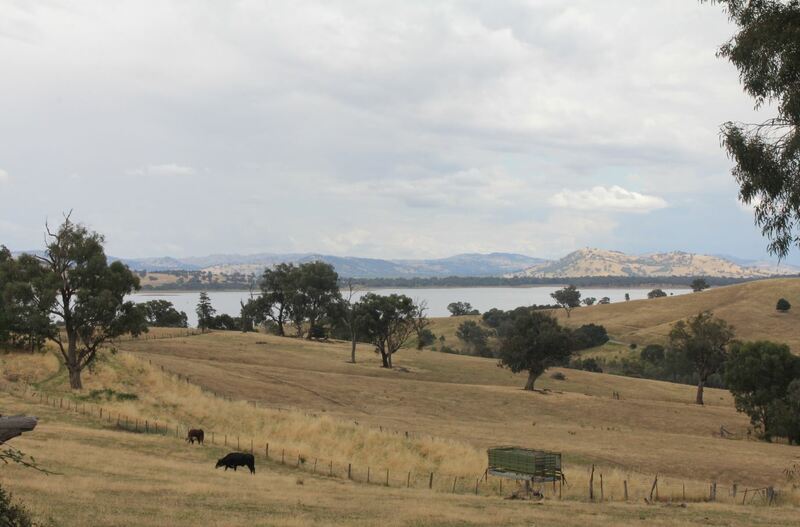 Five years later they had moved back to the mountains and were settled on their own land, a thousand acres or so sold off from the original McMeakin property. Burleton and Stella only had two children, the boy born in Tallangatta and my own grandmother Dulcie. Both children were born in Mannus in Burleton and Stella’s own house, one Burleton built himself with the help of Stella’s father and brothers. As a child, I listened to Stella’s stories of her life. I was ten, and had no idea what to ask about. She used to drive a sulky with a horse, and she would drive it to the train station to collect goods. It sounds as if she drove everywhere – into Tumbarumba, down to Wagga Wagga and Henty, to nearby Rosewood, She was baptised Emily Estelle but she had a cousin of the same age who was also Emily Morey, so she became Stella. As I write this, the story takes on a new importance. I have not identified a cousin for Stella called Emily. I have not located marriages at all for two of her Morey uncles. It was Stella who showed me the family bible, which I have never seen again. We looked for it this visit without success. The family property is looking very neglected now, a consequence of the age and infirmity of the current occupant. Once there were three habitable houses on the place, now there is only one. But the fences remain along with the remnants of landscaping and early bridges. They place has charm. Burleton and Stella – known to us all as Pa and Ma – built their house, planted their orchard and did very well for themselves. Burleton was an able farmer, his cattle and produce won prizes and his farm thrived. In later years after their death, the house was cannibalized to repair the sheds and other houses. Not much remains. On this visit, I did not go in due to the likelihood of snakes. In other years the area nearby was cleared. Their son built himself another house on the property in the 1930s. 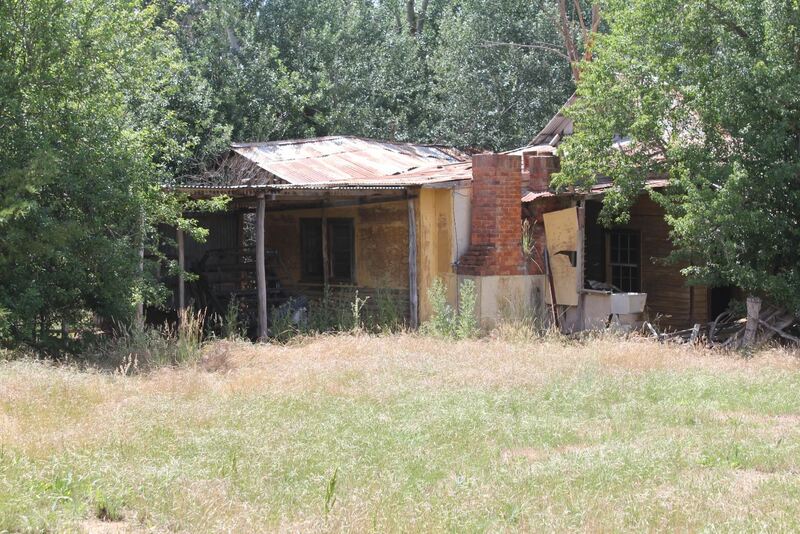 That house has not been lived in for 15 years and was in a poor state at the time of death of its occupant. It still holds furniture but nature is taking over. This house is where I hoped to find the family bible, but did not. It may be there, buried deep in a cupboard under some blankets or clothing. 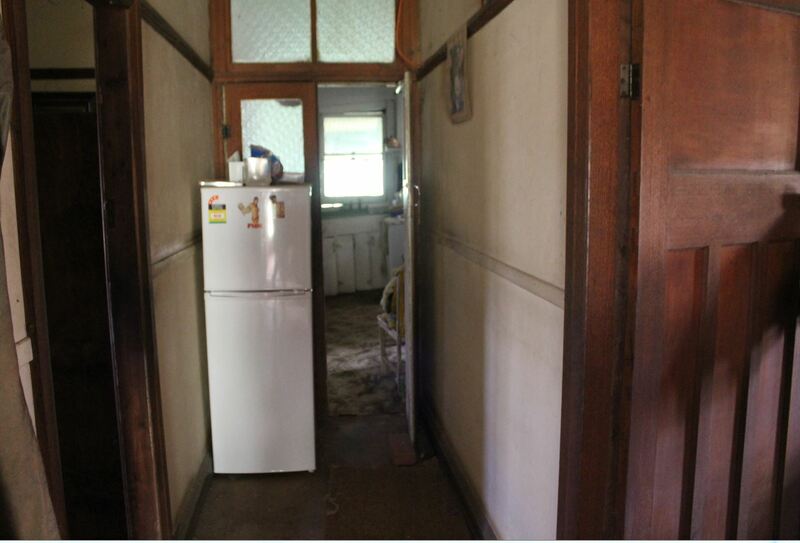 I was a visitor and even in an unoccupied house, had no right to go poking into all cupboards. I asked for permission to look in a few likely drawers but found nothing. The second house on the property at Mannus. In a sad state of disrepair but still furnished. I did find the Boer War medals, but apparently a cousin had come through and removed some of the photographs only six weeks earlier. Hopefully she also grabbed the family bible. I have many memories of this house, and it was sad to see it in its present state. I remember my sister and I sleeping in the third bedroom, sharing the room with my great grandmother who was living there in her old age. We slept in a very old high bed which felt miles from the floor, and were horrified to find a chamberpot under our bed for our use, as the house at that time only had an outdoor toilet. This was the house my mother grew up in, and I have heard her stories too. I know where she did her homework, where she slept, how the dining room was kept in pristine condition and the children were not allowed in it. I remembered sitting at the kitchen table for meals because in my childhood, the dining room was still not used for family. Sadly, the ceiling in that room has now given out – only a few weeks ago – and the room’s contents are apparently ruined. I don’t know this for sure as I could not obtain permission to undo the barricade and poke my head inside. I have some fear that at this point, some of the room’s contents might be salvagable and even precious, but I was always the optimist. The third house on the property is smaller and currently occupied, so will not be posting a photograph. In my next blog post, I’ll cover the relics. 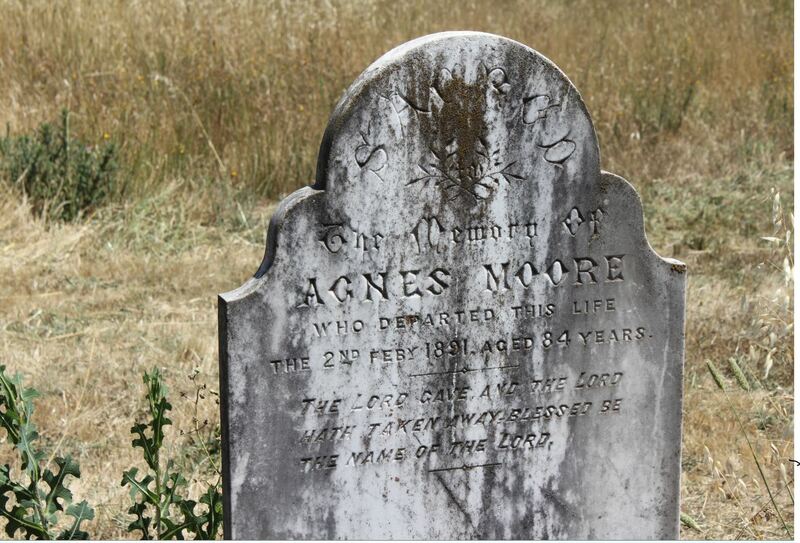 In the past, I have blogged about my Great Great Grandparents William Morey and Frances Fox. William was born in 1851 in the Black Ranges of Victoria in the goldfields district and his parents came from Dorset in England. At the time of his marriage, he was a bullock driver. Frances (Fanny) Fox was an orphan who spent her early years in Hanwell Orphanage in London before emigrating alone to Australia at the age of 13 to become a domestic servant. She arrived in Melbourne in 1871. On New Years Day 1876, gold of high quality was discovered in a region known as Bethanga, an area east of Albury in very hilly terrain. This was all it took to bring a large population to a town. Within a few months land had been claimed, leased or purchased. Houses were built, shops were begun and a smelting works opened up in 1878. The town had gone from nothing to bustling in just a few years. There was a great deal of excitement and a sense of progress in the starting of a mining town, especially a gold mining town. Optimism was high, the spirit of adventure was equally high. Enterprising businessmen could make a fortune by inflating the price of goods and transport, until more businessmen came in to create competition. There seems to have been an almost addictive sense of infallibility which kept families on the move, travelling from one new town to another. With all the startup came the need for services such as domestic servants, and this is what brought Fanny Fox in about 1877 or 1878. Now aged about nineteen, she met William the bullock driver and they obviously got along very well. They were married in Albury in 1879 and settled in Bethanga. What I never knew until this journey was that my grandfather Ken Dunstall was living in Bethanga at the time that he met his second wife in 1949. A widower with three children at home, he was a Rawleigh man – a travelling salesperson with a franchise to sell Rawleigh products. Due to the nature of his job, he required someone to care for the children in his absences and employed a local girl who had recently left her position in nearby Wodonga and returned to her parents at Bethanga. A few years later, the girl became his second wife and a much loved family member. Having two ties to Bethanga, it was suddenly high on my list of places to see, and was conveniently on the road from Wangaratta to Mannus in the Snowy Mountains. So of course we went there. As had happened so much before, there was little signage for Bethanga, but Bethanga Bridge was a good clue. In the past, those who lived there had to traverse a very steep terrain and took extra miles to reach a place they knew was just over the hill. 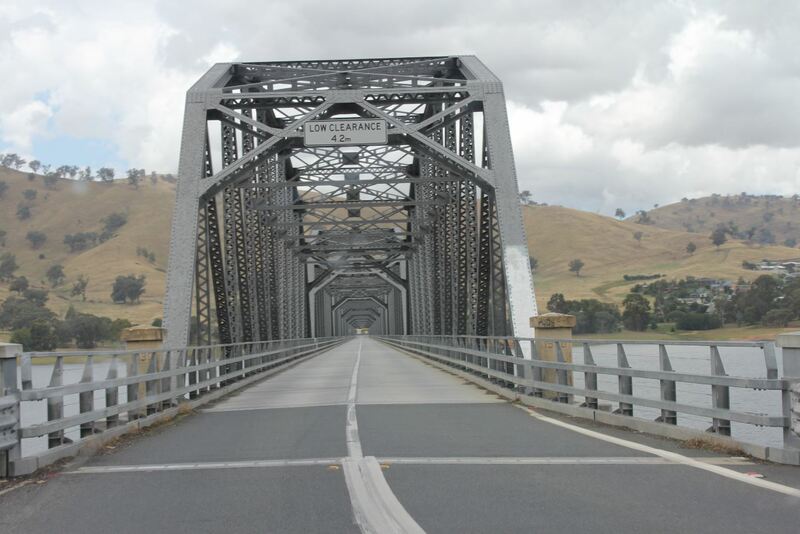 The road now was much more direct, thanks to a most spectacular bridge across the Hume Dam. We enjoyed Bethanga. It was a very sleepy little town with a general store and a hotel with souvenirs and a cafe. There was a memorial hall, a school and a post office. Lots of old houses nestled amongst old trees and looking very picturesque. Very quiet. I could easily imagine that it looked very similar in earlier decades. On an information board were pictures of bullock teams and their drivers, so my William Morey was not the only one. Looking around at the very steep hills, I realised just how dangerous a job that was, and how skilled one would need to be to handle a bullock team on such slopes. We had a bit of trouble locating the cemetery but the elderly gentleman in the General Store was very helpful. It was exactly where he said, but we’d never have found it without directions. We looked at every grave but did not see one with a family name. This was not so unexpected, only one of William and Fanny’s children died young. This was a healthy place for the Morey family. They moved in 1898 to Mannus near Tumbarumba where they became employees of Mr McMeakin who had a large cattle station at Mannus. It was wonderful to see Bethanga at last, but with time getting away and no trace to be found of any of the families involved, we continued our journey, back to Albury and on up the Hume Highway into New South Wales. In many ways, I found my tribe when I met my family in Wangaratta. This was quite unexpected. I’ve met some of them before, admittedly as a child on my best behaviour under the eagle eye of my mother. I guess I assumed I knew them all, despite having only met a couple of them. The first thing that struck me was the family resemblance. They look like my mother. No one ever looks like my mother, but all of these people did. One of my mother’s sisters looks so much like her that I was continually glancing at her. Although her appearance was strikingly similar, she was far more outgoing than my mother is. And they write! This was a big one for me. I have been a writer since about the age of seven. Writing helps me think, helps me relax, helps me daydream and find solutions and understand the world. My mother writes letters, but beyond that there are no other writers in the family I grew up with, and at times my writing time was forcibly curtailed to get me out of doors and participating in local sports. Not my scene at all, but the world I lived in. Writing for me has always been surreptitious, something I couldn’t stop but knew was an aberration. In Wangaratta, I was amongst a group of people who treated writing as part of life. One of my aunts, it turns out, is a published author. One of my cousins is another. They write in very different genres but the love of written expression is the same. Those who do not write complete books write newsletters, diaries and pamphlets for their workplaces and hobby groups. These people were word people. The family is not highly educated, many of them working in manual labour or industrial jobs, but they are thinkers and perceivers. One of my cousins, now aged nineteen, and my own son, are the first in the family to go to university. Education was another strong area of interest in the family and we discussed different education systems in some depth, all of us knowing a great deal of background. When researching a family tree I often do see interests which are passed down the generations, but I have always assumed they were interests encouraged by the older family members. My own mother was raised as a foster child without knowledge of this family, and she certainly did not know about their love of writing. So how is that I have it too? My grandfather’s desire to be a journalist came back to me this week with more meaning. Even by just meeting the family, I had gained a new clue about him. Despite all this, what I learned about my grandfather was that he was something of a mystery to all of them. He will be the subject of my next blog post. My recollection of Wangaratta was a quite large town, with suburbs and traffic lights and a major passenger train station. Admittedly it had been at least twenty years since I was there, but it had industry and employment and was the centre of its region’s health service. I fully expected to find it mentioned on road signs from a long way away. Not so. 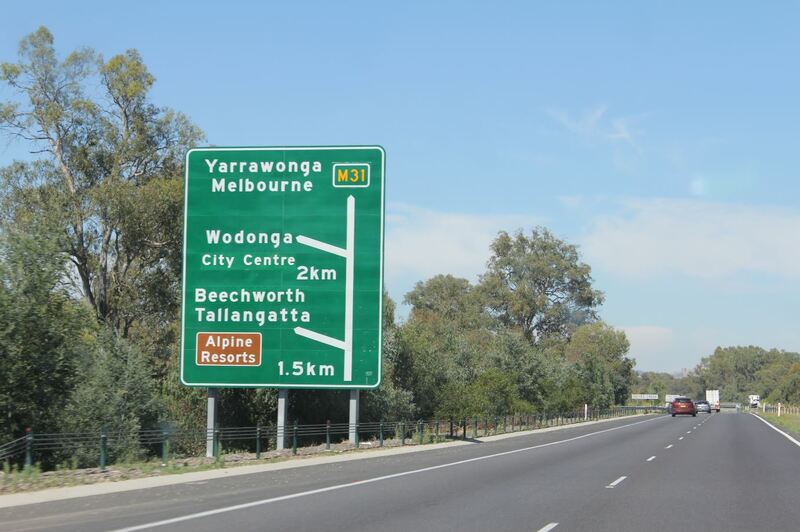 Wangaratta is the town that the signwriters forgot. Leaving Bendigo we had the sign in the above picture, but that was okay. 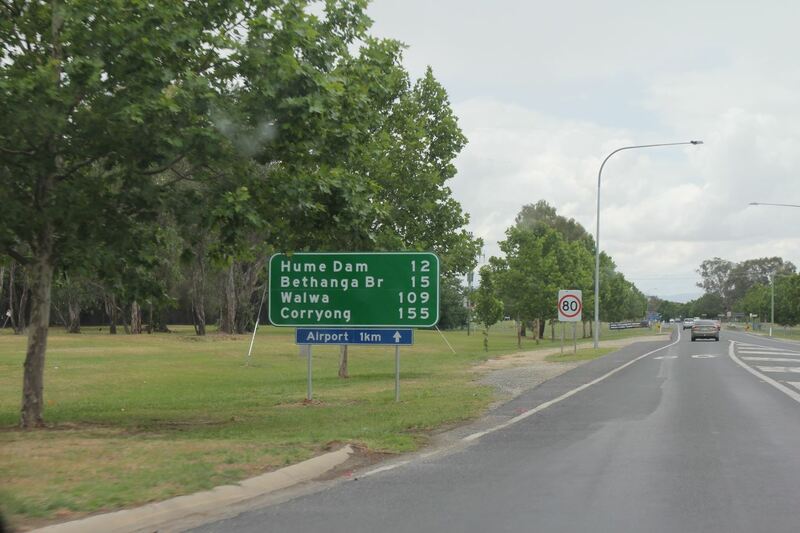 We were still more than 200 km away and we knew Shepparton was on the road so we headed that way. The weather was quite cool for summer and we were a little tired from the poor night’s sleep, but fresh enough to enjoy the drive. A large storm passed through Shepparton the day before we arrived. We saw it in front of us near Kaniva, but luckily we stopped for the night and avoided it. Debris was everywhere along the roadside, in the paddocks and in people’s yards as we neared the small city of Shepparton. Some quite large trees had come down, but we did not see any worse damage. It was furious but fast, as storms often are in Victoria. 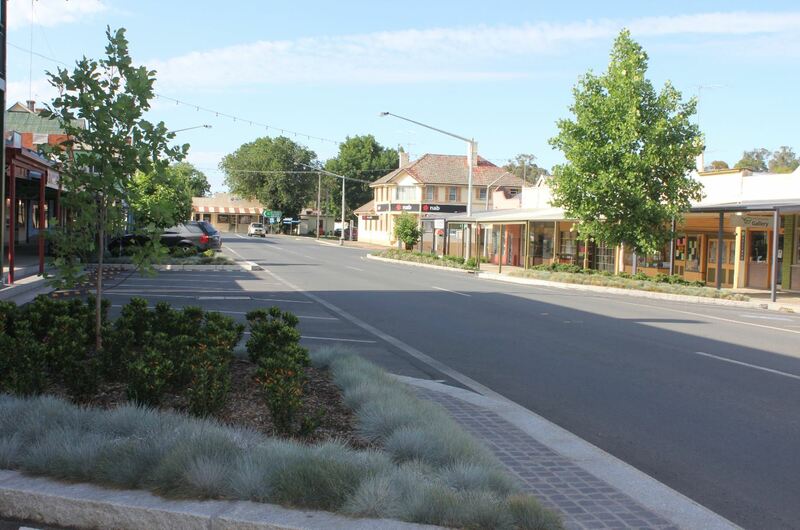 Shepparton started out as a cattle station in the 1840s, and was named for it’s first legal owner, Sherbourne Sheppard. It has a long history. No doubt my ancestors from their early days in Australia have visited the place, but I know of none who lived there. I remember looking on the map before we left home and noticing that Shepparton was about 100km from Wangaratta, so I definitely expected good signage from here. We did not enjoy Shepparton. The traffic was bad, the drivers were very aggressive and honked each other all the time. In just a few kilometres we saw a road rage incident, two cars run red lights and multiple drivers fail to acknowledge pedestrian crossings. For a small city, it was very unfriendly. I was told in the next few days that it has a reputation for it. Having said that, in the end we found a Woolworths Petrol station which was quite busy but at that moment someone had parked over the exit lane and traffic had blocked up while more cars queued in the entry lane. One attendant was pointing out to the driver that he needed to move and while matters were at a momentary standstill I asked for directions. 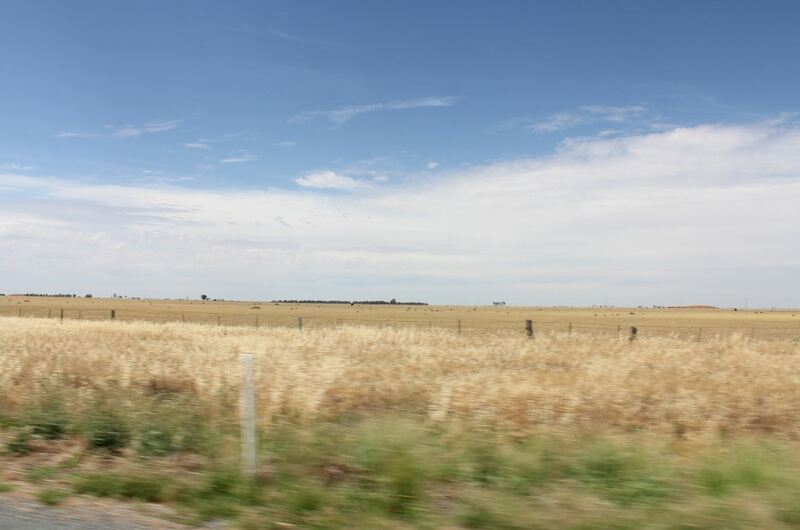 They were very helpful and very friendly and directed us towards the road to Benalla. Finally, coming out of Benalla there it was. 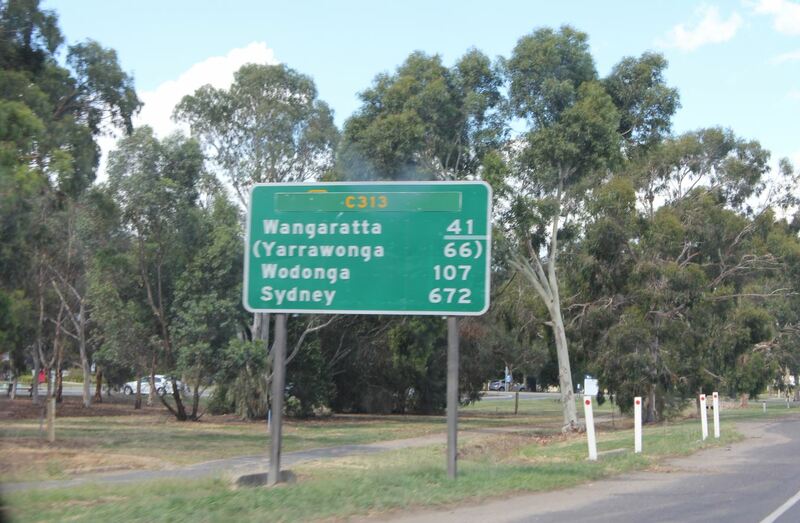 A sign to Wangaratta. The last 41 km were relatively smooth with just one wrong turn taking us onto the old Hume Highway instead of the new, but that was no biggie. We drove into Wangaratta at about 4.30pm and by some miracle found the house we were heading for almost instantly. Finally – after all that driving – the family history research could begin. 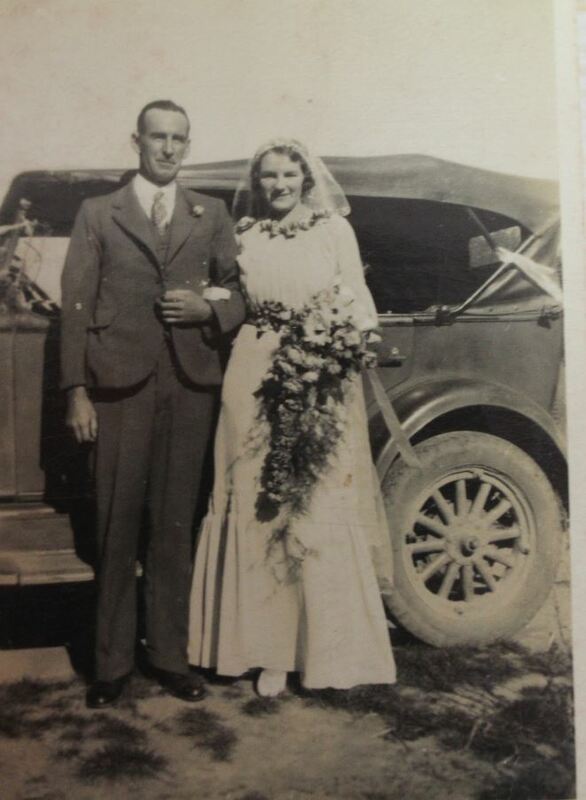 My grandparents Kenneth Dunstall (1900- 1991) and Dulcie Peard (1913-1948) at their wedding in 1936. This is the couple who I hope to ‘get to know’ during this expedition.